Items where SHU Author is "Yoxall, Alaster"
YOXALL, Alaster, GONZALEZ, V. and ROWSON, J. (2018). Analysis of finger motion coordination during packaging interactions. Packaging Technology and Science, 31 (6), 389-400. BELL, Alison, WALTON, Karen and YOXALL, Alaster (2017). Measure for measure: pack performance versus human dexterity and grip strength. Packaging Technology and Science, 30 (4), 117-126. GONZALEZ, Victor, ROWSON, Jen and YOXALL, Alaster (2017). Analysing finger interdependencies during the Purdue Pegboard Test and comparative activities of daily living. Journal of Hand Therapy, 30, 80-88. GONZALEZ-SANCHEZ, Victor, ROWSON, Jennifer and YOXALL, Alaster (2016). Analysis of finger movement coordination during the Variable Dexterity Test and comparative activities of daily living. International Journal of Therapy and Rehabilitation, 23 (10), 481-491. GONZALEZ, Victor, ROWSON, Jenn and YOXALL, Alaster (2015). Development of the Variable Dexterity Test: construction, reliability and validity. International journal of therapy and rehabilitation, 22 (4), 174-180. YOXALL, Alaster and ROWSON, J. (2015). Talking about torque : measuring pack accessibility - a review. Packaging Technology and Science, 28 (1), 1-14. ROWSON, Jenn, SANGRAR, Aamir, RODRIGUEZ-FALCON, Elena, BELL, Alison F., WALTON, Karen A., YOXALL, Alaster and KAMAT, Seri Rahayu (2014). Rating accessibility of packaging: a medical packaging example. Packaging Technology and Science, 27, 577-589. CANTY, Laura A, LEWIS, Roger and YOXALL, Alaster (2013). Investigating openability of rigid plastic containers with peelable lids : the link between human strength and grip and opening forces. Proceedings of the Institution of Mechanical Engineers, Part C: Journal of Mechanical Engineering Science, 227, 1056-1068. YOXALL, Alaster, RODRIGUEZ-FALCON, E.M. and LUXMOORE, J (2013). Carpe diem, Carpe ampulla : A numerical model as an aid for design of child resistant closures. Applied Ergonomics, 44 (1), 18-26. YOXALL, Alaster (2013). Accessing packaged food and beverages in hospital. Exploring experiences of patients and staff. Appetite, 60, 231-238. CHAMBERLAIN, Paul and YOXALL, Alaster (2012). Of mice and men : the role of interactive exhibitions as research tools for inclusive design. The Design Journal, 15 (1), 57-78. ROWSON, Jenn and YOXALL, Alaster (2011). Hold, grasp, clutch or grab: Consumer grip choices during food container opening. Applied Ergonomics, 42 (5), 627-633. KAMAT, Seri, YOXALL, Alaster, CRAIG, Claire, CARRE, Matt and ROWSON, Jenn (2010). Understanding grip choice and comfort whilst hoovering. Proceedings of World Academy of Science, Engineering and Technology, 66, 1338-1343. LANGLEY, Joe, YOXALL, Alaster, HEPPELL, Geoff, RODRIGUEZ-FALCON, Elena, BRADBURY, Steve, LEWIS, Roger, LUXMOORE, Joe, HODZIC, Alma and ROWSON, Jenn (2010). Food for Thought? - A UK pilot study testing a methodology for compositional domestic food waste analysis. Waste Management & Research, 28 (3), 220-227. YOXALL, Alaster, LANGLEY, Joe, JANSON, Rob, LEWIS, Roger, WEARN, Jenn, HAYES, Simon and BIX, Laura (2010). How wide do you want the jar? The effect of diameter on opening of wide-mouth closure. Packaging Technology and Science, 23 (1), 11-18. YOXALL, Alaster, LANGLEY, Joe, JANSON, R., LEWIS, R., HAYES, S. A. and BIX, L. (2010). How wide do you want the jar? : The effect on diameter for ease of opening for wide-mouth closures. Packaging Technology and Science, 23 (1), 11-18. RODRIGUEZ-FALCON, E.M. and YOXALL, Alaster (2010). Service-learning experiences: a way forward in teaching engineering students? Engineering Education, 5 (2), 59-68. YOXALL, Alaster, SANDHAM, A, TOMLINSON, R A, ROWSON, J and BLAKEY, S (2009). Squeezability. Part 1: a pressing issue. Proceedings of the Institution of Mechanical Engineers, Part C: Journal of Mechanical Engineering Science, 223 (11), 2615-2625. TOMLINSON, S. E., LEWIS, R., BALL, S., YOXALL, Alaster and CARRÉ, M. J. (2009). Understanding the effect of finger–ball friction on the handling performance of rugby balls. Sports Engineering, 11 (3), 109-118. LANGLEY, Joe, YOXALL, Alaster, MANSON, Graeme, LEWIS, Walter, WATERHOUSE, Alison, THELWALL, David, THELWALL, Sarah, PARRY, Andrew and LEECH, Barbara (2009). The use of uncertainty analysis as a food waste estimation tool. Waste Management & Research, 27 (3), 199-206. YOXALL, Alaster, LUXMOORE, Joe, LANGLEY, Joe and JANSON, Rob (2008). Size does matter: further studies in hand-pack interaction using computer simulation. Packaging Technology and Science, 21 (2), 61-72. LEWIS, R., YOXALL, Alaster, MARSHALL, M. and CANTY, L. (2008). Characterising pressure and bruising in apple fruit. Wear, 264 (1-2), 37-46. LEWIS, R., YOXALL, Alaster and MARSHALL, M. B. (2008). Comparison of numerical and ultrasonic techniques for quantifying interference fit pressures. Proceedings of the Institution of Mechanical Engineers, Part C: Journal of Mechanical Engineering Science, 222 (7), 1125-1130. YOXALL, Alaster and JANSON, R. (2008). Fact or friction: a model for understanding the openability of wide mouth closures. Packaging Technology and Science, 21 (3), 137-147. ROWSON, Jenn, YOXALL, Alaster and HART, John (2008). Modelling capping of 28 mm beverage closures using finite element analysis. Packaging Technology and Science, 21 (5), 287-296. YOXALL, Alaster, LUXMOORE, J., ROWSON, J., LANGLEY, Joe and JANSON, R. (2008). Size does matter: further studies in hand–pack interaction using computer simulation. Packaging Technology and Science, 21 (2), 61-72. LEWIS, R., YOXALL, Alaster, CANTY, L. A. and ROMO, E. (2007). Development of engineering design tools to help reduce apple bruising. Journal of Food Engineering, 83 (3), 356-365. LEWIS, R, MENARDI, C, YOXALL, Alaster and LANGLEY, Joe (2007). Finger friction: grip and opening packaging. Wear, 263 (7-12), 1124-1132. YOXALL, Alaster, LUXMOORE, J., AUSTIN, M., CANTY, L., MARGRAVE, K. J., RICHARDSON, C. J., WEARN, J., HOWARD, I. C. and LEWIS, R. (2007). 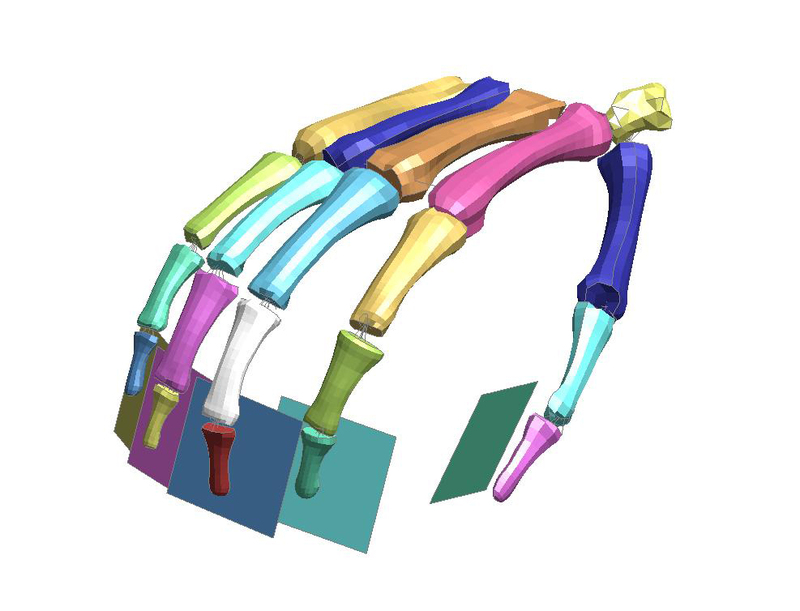 Getting to grips with packaging: using ethnography and computer simulation to understand hand–pack interaction. Packaging Technology and Science, 20 (3), 217-229. LANGLEY, Joe, JANSON, R., WEARN, J. and YOXALL, Alaster (2005). ‘Inclusive’ design for containers: improving openability. Packaging Technology and Science, 18 (6), 285-293. GOODMAN-DEANE, Joy, WALLER, Sam, BRADLEY, M., YOXALL, Alaster, WIGGINS, D. and CLARKSON, P.J. (2016). Design inclusive packaging. In: BURGESS, Peter, (ed.) Integrating the Packaging and Product Experience in Food and Beverages : a Road-map to Consumer Satisfaction. Woodhead Publishing, 37-57. GOODMAN-DEANE, J., WALLER, S., BRADLEY, M., YOXALL, Alaster, WIGGINS, D. and CLARKSON, P.J. (2016). Designing Inclusive Packaging. In: BURGESS, Peter, (ed.) Integrating the Packaging and Product Experience in Food and Beverages. Elsevier, 37-57. GWILT, Ian, YOXALL, Alaster and DREW, Laura (2015). Augmented packaging for improved medicine compliance. In: CHRISTER, Kirsty, (ed.) Proceedings of the Third European Conference on Design4Health 2015. Sheffield, Sheffield Hallam University. YOXALL, Alaster, BELL, Alison and WALTON, Karen (2014). Warning! : packaging can damage your health. In: YOXALL, Alaster and CHRISTER, Kirsty, (eds.) Proceedings of the Second European Conference on Design 4 Health 2013, 3–5 July 2013, Sheffield UK. Sheffield Hallam University, 303-315. GWILT, Ian, YOXALL, Alaster and SANO, Koutaro (2012). Enhancing the understanding of statistical data through the creation of physical objects. In: DUFFY, A, NAGAI, Yukari and TAURA, Toshiharu, (eds.) The 2nd International Conference on Design Creativity (Proceedings). UK, Design Society, 117-124. RODRIGUEZ-FALCON, Elena and YOXALL, Alaster (2012). Investigating the impact of service/social enterprise learning projects and employer involvement in engineering education. In: HARRISON, Matthew, MOORE, Ivan, IGARASHI, Hal and SOMANI, Sapna, (eds.) Enhancing engineering higher education : outputs of the national HE STEM programme. London, Royal Academy of Engineering, 95-98. BEC, Rémi (2011). Designing Gener-G, the human energy trading game. In: YOXALL, Alaster, (ed.) Proceedings of the 1st European Conference on Design 4 Health 2011. Sheffield, Sheffield Hallam University, Art and Design Research Centre, 5-21. LANGLEY, Joseph, YOXALL, Alaster, REED, Heath and KUHLMANN, Stephan (2011). Is green a grey area? Sustainability and inclusivity; the ageing population and recycling. In: Include 2011 proceedings. RCA. YOXALL, Alaster, ROWSON, Jenn and KAMAT, Seri (2011). What can a hand really squeeze? In: Include 2011 proceedings. London, The Helen Hamlyn Centre for Design, Royal College of Art. RODRIGUEZ-FALCON, E.M. and YOXALL, Alaster (2010). Accessibility is in the palm of your hand. In: LANGDON, P, CLARKSON, P. John and ROBINSON, P, (eds.) Designing inclusive interactions : inclusive interactions between people and products in their contexts of use. London, Springer-Verlag, 45-54. YOXALL, Alaster, LANGLEY, Joe, MUSSELWHITE, C, RODRIGUEZ-FALCON, E.M. and ROWSON, J (2010). Husband, daughter, son and postman, hot-water, knife and towel : assistive strategies for jar opening. In: LANGDON, P, CLARKSON, P.J. and ROBINSON, P, (eds.) Designing inclusive interactions : inclusive interations between people and products in their contexts of use. Springer-Verlag, 187-196. YOXALL, Alaster, LANGLEY, Joe, LUXMOORE, J., JANSON, R., TAYLOR, J.C. and ROWSON, J. (2008). Help or Hindrance: The Use of Tools for Opening Packaging. In: LANGDON, Patrick, CLARKSON, John and ROBINSON, Peter, (eds.) Designing Inclusive Futures. London, Springer, 65-74. HAAKE, Steve, BLACKWOOD, W. D. and YOXALL, A. (1998). Photo elastic analysis of ice-axe impacts. In: Proceedings of the SEM spring conference on experimental and applied mechanics. Society for experimental mechanics, 290-293. YOXALL, Alaster (2014). Europack 2014. In: EuroPack Summit 2014, Cascais, Portugal, 8th-9th September. BELL, Alison, WALTON, Karen, WESTBLADE, Nicola, MORSON, Kate, CHEVIS, Jacqueline, HARRIES, Leire and YOXALL, Alaster (2014). If at first you don't succeed : older consumers and hospital food & beverage packaging – a matter of try, try and try again! In: 19th IAPRI World Conference of Packaging, Victoria University, Melbourne, Australia, 15th-18th, June 2014. YOXALL, Alaster (2012). Understanding Packaging Accessibility. In: Europack 2012, Cannes, France, 17th-18th September 2012. LANGLEY, Joseph, YOXALL, Alaster, CRAIG, Claire and REED, Heath (2011). Assisted Services - Physical support or psychological blow? In: Design 4 Health European Conference and Exhibition, Sheffield, UK, July 13-15. YOXALL, Alaster, HELLER, Ben and CHAMBERLAIN, Paul (2011). Oom Bop Bop Good Vibrations: the use of sensory feedback to create motion inhibition. In: Include 2011, Royal College of Art, London, 18-20 April 2011. LANGLEY, Joseph, YOXALL, Alaster, JANSON, Rob and WEARN, Jenny (2005). The 'inclusive engineering' approach: an optimum diameter for ease of opening. In: 22nd IAPRI Symposium on Packaging, Campinas, May 22-25. YOXALL, Alaster (2011). DD CEN/TS 15945:2011 Packaging. Ease of opening. Criteria and test methods for evaluating consumer packaging. BSI. This list was generated on Tue Apr 23 07:42:16 2019 UTC.